I'm reporting the following bug per Shog9's request. You edit any post on a SE site where you have edit privileges. In a second edit within the grace period of the first, you revert all changes you made (character by character, not a rollback) . The post is now the same as it was before, but neither edit appears in the revision history. It looks like the post has never been changed. If somebody vandalizes the post and it gets severely downvoted before the edit gets undone and nobody rolls the edit back, there's no history of what happened. This allows 2k users to undo or reverse up- and downvotes in a concealed manner. This has been addressed and should be in the next build. We tried the exploding computer trick, but testing got expensive. After that, we decided to have these kinds of edits that occur within the grace period leave a revision behind, but with a comment ("Edit removed during grace period") indicating that the edit was a "grace-period reversion". The grace period itself has not been changed. 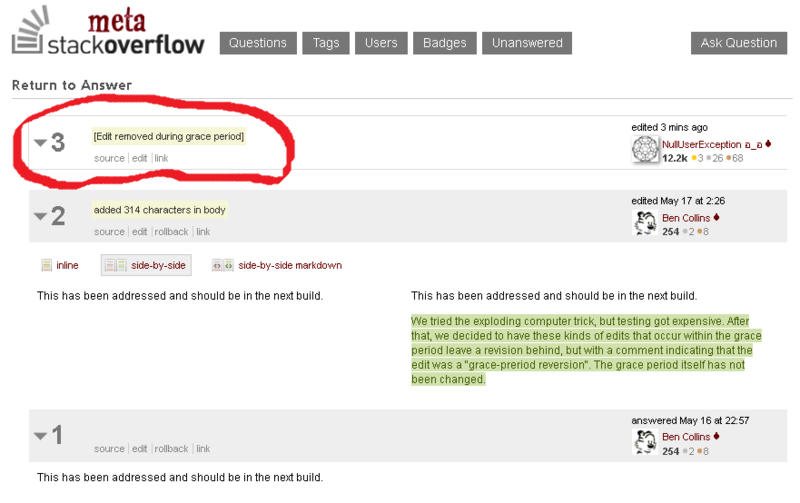 To clarify why I view this a bug, consider that the "grace period" for edits is already a compromise: unlike many wiki systems, Stack Exchange does not have any notion of "minor" edits, changes that don't fundamentally alter the meaning of a post. We encourage substantive edits, but of course mistakes do happen - so to prevent mile-long revision histories, the 5-minute grace period allows quick fixes to be made shortly after creating or revising a post without adding a new revision. These "stealth edits" are lies. Each actual revision is visible, albeit for only a short time, live on the site... But the revision history doesn't reflect them. With the new real-time updates, you can sit and watch a post as it is edited, reloading each new revision, with only the final version tracked in the history. It's philosophically dishonest, but extremely practical. And although new users are occasionally confused by it, it's easy to use (and abuse for fun and profit) and considerably more simple than a true minor edit system. So while every edit may not create a revision entry, every editor will have at least one revision entry for every five minutes of editing. That's still a fairly simple system to grasp. Until you throw in the ability to completely destroy a revision within that grace period. For the record: a tool does exist within the system to destroy a revision - any revision - permanently. It's used in cases where someone inadvertently posts sensitive information - the username and password to their production database, or a credit card number. It's considered so dangerous that even moderators don't have access to it. Why? Because it changes history. This particular "feature" is much less dangerous. You can destroy at most five minutes of history, and any other editor who intervenes will thwart even that. But when it works, the effects are every bit as chilling: there is literally no trace remaining that you've ever even touched the post. Frankly, this is so shocking to me that I never considered for a moment that it would even be possible. I assumed the folks referencing it here were just being casual and/or confused in their descriptions of how the grace period worked. Most ironic though was the suggestion that this can be used to silently retract locked votes. For those who've forgotten: vote-locking was implemented to discourage so-called "strategic voting", where a competing answer would be downvoted and then the vote retracted later. This bug not only removes what little efficacy that might have once had, but introduces the specter of strategic editing. Has this ever happened? Probably not. Hopefully not. But it's kinda hard to tell, since if it did any evidence would've been destroyed. Not the answer you're looking for? Browse other questions tagged bug status-completed edits revisions-list . How long can you change your vote?